We thought we’d put together a few posts that show you some of our favorite signs we’ve designed and mounted in specific cities around Ventura County, and tell you a bit about the companies they represent. The iconic Ventura pole sign was designed to highlight the city for everyone who passes by on the freeway, inviting them to stay, surf, shop, and eat. The exposed neon ensures that the sign is even more eye-catching at night. Click here to read more about it. This World Famous Fish Taco restaurant won the vote for best fish tacos in Ventura county by the VC Reporter. 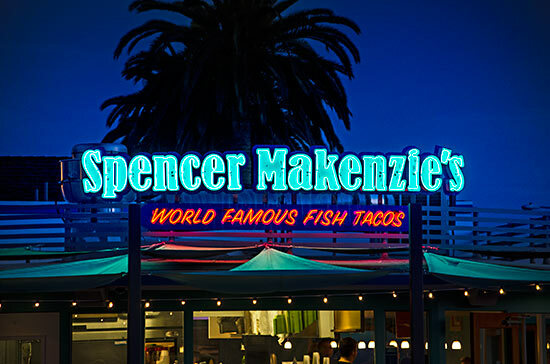 Building a sign for a famous fish taco restaurant is easy with brightly-colored exposed neon, with a slogan that communicates just that. Click here to read more about the process of building this sign. The sign for Red Brick Pizza is made of reverse-lit channel letters, which gives the sign a luminescent glow at night. The best part is the red of the pizza that sits above the white lettering. The Busy Bee Cafe was a premier meeting place for Ventura’s earliest merchants since 1963, and has had the same owners since its start. This exposed neon sign maintains the old-fashioned feeling of the diner for years to come. Speaking of bees, the giant bee on the corner of Main & Pacific, Superbuzzy is the home of Japenese fabrics, craft supplies, and unique gifts imported directly from Japan. A painted bee flying away from the channel lettering on the front is complimented by a giant bee painted on the side of the shop, capturing attention from all directions for the boutique shop. Once a World War II warehouse building, Discovery Ventura transformed the building into a high-end bar, restaurant, and bowling alley, with a concert stage in the back. The exposed neon channel letters sit above the outside patio, and the simple sans-serif lettering makes space for the excitement of the name to capture people’s attention. 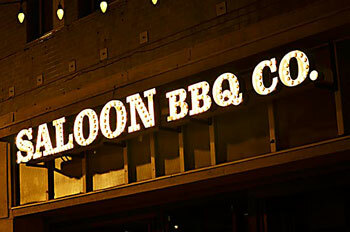 BBQ pulled chicken, brisket sandwiches, and some of the best drinks in town make up the menu of Saloon BBQ Company’s western-themed restaurant highlighting California’s West Coast. This saloon sits on Main Street, West of California. More than just a haircut, Freddie B offers a full spa experience, complete with cucumber water, an indoor fireplace, and wifi while you wait for your color to set. The reverse-lit serif channel lettering is light-blue, and communicates the calm atmosphere of the space. White Sand boasts Modern Thai Cuisine, with an interior decoration that offers a glimpse into Thailand on Main Street Ventura. Simple, elegant, with a turquoise line that highlights the length of the restaurant, this sign is made entirely of exposed neon. Buffalo Exchange is a chain of vintage and used clothing stores that can be found in cities all along the West Coast. Each shop features the style of the city, and ours is on Main Street, just East of California St. The blade sign we mounted for them on Main Street is three-dimensional, with reverse-lit channel lettering, and highlighted by retro exposed neon lines on each side.